Rather than bore you with a handful of other random gadgets and doodads that run Linux, I’ve decided to focus on one really big thing that’s phenomenal. 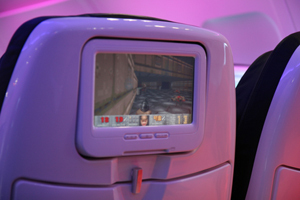 So I present to you, dear readers, with Virgin America’s in-flight entertainment system, RED. I’ve written about it once or twice before and every flight I take on VA gets better. I’ll be flying to Vegas this weekend for CTIA and I’m as giddy as a schoolgirl because I’ll be taking VA. It’s a completely different experience and its only getting better, but don’t take my word for it. You should really take advantage if they’re servicing your city. If not, then wait it out and try it when you can. It’s definitely worth it and once Aircell’s GoGo network is implemented into VA’s fleet, you won’t find a better airline in the US. Today, we’re interviewing Charles Ogilvie, the Director of Inflight Entertainment and designer of RED. CG: Why did you pick linux for RED? How long was it in testing? Did Microsoft approach you about running Windows on the back end? We’ve talked with a lot of software vendors. What was the hardest part about creating the system? Was it the software? The hardware? The hardest part is maintaining agility. The beauty of the architecture is that we can continue to move forward, innovate and constantly look for additional areas to add new, unprecedented functionality like our inflight food ordering system or seat-to-seat chat. Why don’t more people use Linux in high traffic situations like this? I don’t know. They should. Resets or reboots occur in different areas. Because we are trying different open source games, we do notice issues with porting them for example. Over time, we work through those issues. Our inflight team members (flight attendants) have the ability to reboot seats. The seat units also monitor themselves and can reset themselves if they freeze or lose connectivity (a heart-beat) with the head-end. What’s the deal with the in-flight chat? Why was that included? Have people connected through that? What’s in store for the future besides in-flight Wi-Fi? The ability to compose a music-video playlist is pretty cool and on the horizon. The READ section is also awesome in that it takes what is typically a bunch of wasted trees (excess newspapers, periodicals) and allows us to be more environmentally friendly and timely with things like news/event info/sports/entertainment etc.